Along with Hossein Kazemi (whose work is also represented in the NYU Art Collection) and Houshang Ajoudani, Mahmud Javadipur founded Apadana, the first art gallery in Tehran, in September 1949. Although it remained open for less than a year, it quickly became a gathering site for intellectuals. Javidipur’s own work, impressionistic paintings of village life, draws on traditional Persian subjects while referencing modernism. Persian Picnic depicts a group of men relaxing in the countryside. Their turbans are in the style of those worn during the Safavid Empire (1501–1736). Although Persian Picnic is a woodcut—a medium not historically used by the Persians to depict figures—it has a painterly quality similar to that found in Javadipur’s paintings. 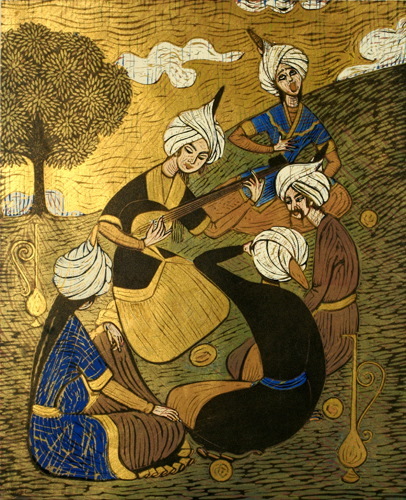 Javadipour, who had studied in Munich during in the 1950s, worked in a variety of styles including the traditional mode inspired by miniature painting seen here. The dark-colored lines created by the printing technique, for example, mirror the visible brushstrokes of Impressionism. Dimensions 21 5/8 x 17 1/2 in.